So, today I wanted to talk about the strange divide I have seen regarding recent issues I've had with work being stolen. Which is a tricky thing, because the work in question is fan art. 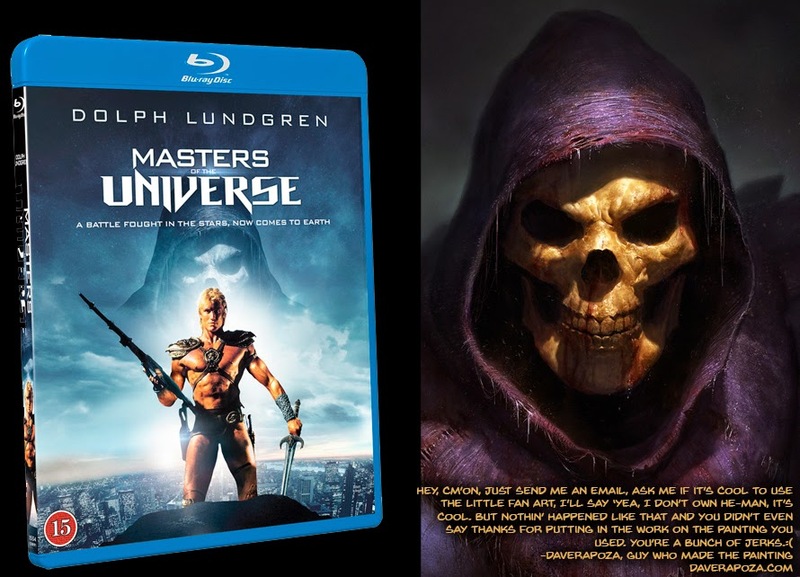 Recently I was sent a message stating that someone had bought a blu-ray in Sweden of 'Masters of the Universe' and that it had my 'Skeletor' piece on the cover worked into the design. They asked me if I had given permission or had been compensated. I said no. If you follow my work, it's nothing new that I'd post about art theft. This kind of thing happens all the time and when the issues get enough attention it's easier to do something about the theft. So, I made up a small image showing the blatant use of the image, you can check it out below. All I was really looking to do was point out that I hadn't been asked or credited. I was not looking to pursue anything beyond that as I said on the image itself, I don't own Skeletor. That being said, after it got picked up, I've been seeing a big divide online. Most everyone is happy to point out that it's theft, a lot of people would say it's the creators fault for making fan art, and some, as always, just wanna see you run over by a truck in the street. But you can't escape the internet, so we can't fight that haha. I don't want to give you the wrong idea, I've benefited directly from creating this Skeletor painting. It has lead to many job opportunities, it's given me great exposure, and even allowed me to work on official MOTU stuff. I couldn't be happier, it's been great to have in my portfolio. This is why I don't really have a major issue with the image being used. That being said, I know that it is a violation of basic copyright. For instance, maybe you saw the recent 'Power Rangers' short film that was going around, it's the adult themed one with the violence and everything. Saban in this instance, they can't just take that movie because it has their characters in it and then release it on their own to make profit from. Same thing goes for images, somebody may own the characters you're working with, but they don't then own the images created. These images still belong to you in and of themselves. In the same way they could have hired you to create this image, they can then purchase the piece from you to use after the fact. With a lot of my fan art, this is how I make money back, through licensing deals. Whenever a company owns a license to Marvel or Masters of the Universe, they can contact me and then they can distribute my previously created fan arts. This doesn't happen all the time, but it does happen every so often. Which is where I wanted to get into my personal benefit from work like this, this is where I become the illegal man. So, the very first fan art images I did, or some of the first at least, were the TMNT portraits. I made 15 of them in total and spent anywhere from 8-30 hours on each one. At this stage in my career, I was really poor, living way outside of my means hoping to pressure myself into working harder. So I said, I bet if I did these TMNT, I could get my name out there. Now, the mistake I made was assuming nobody would care if I made a short run of prints of each portrait. There were 40 of each and something similar with the rest at NYCC. I had convinced myself it was cool, nobody knew me, and I was like half and half sure that it would fall under parody law? But let's be honest, I just thought that making my time back on the prints would be possible this way. This happened back in early 2011, I was living in Boston and struggling to get to the next potential level with my artwork. Nobody was paying me to do the things I thought I could excel with and jump forward with, so I did it for myself. This series lead me to all of the jobs and my personal career today, I'm forever grateful for the Turtles. And that is where I come back to the theft. When I shared the above image of the stolen work, I was contacted by quite a few people that I am not one to talk. After the image got around it started to come up more and more. Four years ago, I sold the TMNT prints without fully realizing the issues involved with doing so, I talked with Nickelodeon and Kevin Eastman about the portraits and they seemed to like them. I just kinda assumed it wasn't an issue, but that's wrong. No matter the amount, I did still profit at the end of the day from the work. Since then I've worked on many TMNT projects officially, and nobody called foul, ever. This is the weird thing about theft. If you're getting featured on all the blogs bringing any sort of positive attention to a franchise, nobody will really come after you, at least not aggressively. But on the flip side, if your theft involves hurtful content that messes with the brand, they're all over you. So you get this weird idea of what theft really is in the eyes of the company and it distorts your view. Four years ago I sold 40 prints each of 15 portraits, and four years before that I almost went to jail for five years. I'm not the same person I was eight years ago and I'm not the same person I was four years ago. I've learned a lot since then, and I don't want whatever ideas you may have of me to cloud the fact that a major company blatantly used work without any contact, whatsoever, to the artist. This could happen to anybody, and because of my past I don't really want to necessarily pursue legal action. Just don't assume that you don't have rights in these things, regardless of whether or not you've been in the wrong before. Even if it's fan art, you still did the work itself. Anyways, thanks for reading me ramble on. The past 48-ish hours have been crazy, I've received hundreds of messages about the theft and I appreciate all of the comments, the critical and the supportive. I hope you are doing good! Now I gotta get back to my real work :)! With you from the Get Go Dave. Starting on GamingW and just getting a tablet, to being the legendary artist you've grown to become. And as always looking forward to more art. Thanks for sharing something personal like this. Great insight and we appreciate the honesty, as well are you superb work. Appreciate the insights man. Sounds tricky for sure, I can't imagine what it's like, sounds hectic. However, dancing on the razor's edge there with the TMNT prints really paid off. Great stuff! I can not sympathise with you on this current situation Dave, I tried because I like your work and you come across as very decent, but I can not sympathise with you on this. It is the fact that you initiated this predicament when you went out of your way to paint a piece depicting a character that you do not own. Granted you did this as a fan, but Skeletor's name and likeness are are the intellectual property of someone else, it was you who initiated his situation by taking their character and putting him in a painting of yours. Now if you stopped there, it would still be fine, after all it was your labour and your time that was spent, and I could understand you feeling ownership of that piece, had you not published it online. You could draw whatever you want and still retain ownership of it if you kept it to yourself, but you chose to gain from it by publishing it online. You have done this repeatedly and we all know that your gain from it need not be financial, you got people looking at your work, it was in your portfolio and you gained some recognition in the industry for painting those characters. Now had you made up random characters and painted them to the same level, I think we would be in agreement that it would not have had such a strong impact on your online presence and recognition in the field. So you did profit from the Skeletor painting, even by your own admission. Now I assume that you did not send the IP owners a cheque for the use of their character. Would you not consider that theft? It is pretty low of you to cry foul when you have established yourself using other people's characters. The people behind that film saw a painting of the character that they owned, and went on to use that image assuming they had rights to it, after all, it is THEIR character. Of course I would not say that was a nice thing of them to do, but lets be honest, it is as shady as what you had done by using their character without their permission and publishing it on your website. Lets not kid ourselves, you could have painted Skeletor and enjoyed the painting and kept it to yourself, but you stood to profit from publishing it, so you did. Big respect for courage and honesty sharing your story! It makes me sad that people can blame you for creating fan art and don't understand that it is foremost a form of sharing appreciacion and love towards a franchise, and there are legal ways to acquire fan art for commercial use which preserve satisfaction for every party involved. I own 5 of your TMNT prints, and they are hanging in frames on my wall, everyone that comes over loves them. I know it is little solace, but I can say that your work on those has at least made me and my friends and family happy and we appreciate it for what it is, ART! I still remember your generosity, as I asked for the 4 turtles but you had sold out of Aprils, yet you still sent me an April. Vito - I don't think you understood what I was saying. I said it was wrong and I know it's from to directly profit from fanart. The exposure side though, that's a different story. What's strange about that is a lot of people put out their portfolios with recognizable characters that are in line with what the company they're aiming to work for is looking for. In fact, in order to even work for Marvel or DC, you must show pages to the art directors or you will not be considered. There is no difference here, I created the fan arts in hopes of being put in line with someone I could work with on the properties, and with the exception of a few, it's been relatively successful. I don't mean to say that it's right to benefit, but sometimes there is no other way to even start working for said companies. Now, the distinction is whether or not it is popular. Thankfully I've been lucky enough that the style and approach has resonated with people and gotten me exposure online. But does that mean everyone putting portfolio pieces including recognized characters should then pay reparations? I don't think they should, it is necessary to move forward and acquire clients. If you do get popular from the piece itself, and it goes out of your control, that's not your fault. There is no sympathy to be had, as I said in the post, I know selling the things is wrong and I know for sure I've benefited quite a bit. But where is the line where you owe somebody the work from clients that have nothing to do with the piece itself aside from the fact that they like the style and end product. I do not believe you then owe money to these people forever onward. But I'm not here to change your mind, and if you believe ownership of an IP excludes others from drawing pictures and sharing them, then I don't know what to tell you. I did it when I was 5 and I still have fun doing it today. I genuinely love the characters and want to share my interpretations of them. If that means I get to work on those characters officially and make a living, that's an amazing thing. "If you do get popular from the piece itself, and it goes out of your control, that's not your fault. " Dave, that is not correct. If you do get popular from the piece itself, and say, it goes viral and gets you recognition, it is directly your fault as that was your intention from publishing it. I am not saying artists should never do fan art, when you work hard to attain a certain level at any skill you can do with that skill whichever it is that makes you happy. My problem is with the publishing of said fan art for the potential widespread attention that your art would not get without giving a well recognised character some sort of artistic touch/twist, I think you get what I mean. What you did was in the grey zone and although I would agree what they did by using your art was not a classic move, I would not have made such a big deal of it given that you owe their character at least some of the recognition you gained when you desperately needed them. You see it is easier for me to be harsh on you, you are this guy I have followed from your early days and feel (in some weird way) some pressure to give you my opinion. They, on the other hand are some faceless chain of studios and frankly do not care what the next horrible thing they do is. What I am trying to say is, I got an impressin of what type of person you are, decent and hardworking so did not like what I saw as your response in this incident. Some of these comments are disgusting. Drawing fanart and getting attention is not "stealing" from the original IP holder, "attention" can't be stolen. If anything you're providing free attention to the IP without them having to hire an artist. No matter the original, you are not allowed to take someone else's work and redistribute it for profit. It's not just not a "classic move" it's straight up illegal and disrespectful to artists and people who support them. This apologist tripe I see on imgur and here is just gross. When you put these to points together, what you are really telegraphing is that you want no one to simply produce fan material or use any one else's IP in any way what so ever, lest they want it to be stolen and redistributed for profit. What a sad world that would be. I'm a big fan of your work. I'm also an attorney, and I'd be happy to share some general thoughts about the issues I see discussed in your post as well as in the comments. If you'd like to discuss anything further, I would be more than happy to out of gratitude for your inspiring contributions to the art world. But please keep in mind that this does not create an attorney-client relationship, and anything I post here does not constitute legal advice. You seem to have a good grasp of IP law, and I expect that you'll be familiar with a lot of the basics. I haven't studied your original post of this painting, but since you've admitted here that it was a depiction of Skeletor I will take for granted that it constitutes a derivative work. As a starting point, the owners of the original work have exclusive rights to create derivative works. Derivative works may enjoy their own copyright protection, depending on how transformative they are. I'm pretty sure you haven't used an existing image as a basis for your work, so you'd have an argument as to transformativeness. As you know, there is also a question as to whether your use was commercial. That you haven't sold it helps and whether you have ads on your websites would be a factor. Gaining general recognition to further your career could potentially be considered, but it's less direct and thus less predictable. Of course, there's everyone's favorite: the Fair Use defense. Suffice it to say that Fair Use involves a deep factual analysis and it's hard to predict which way a court would come down, particularly in a case like yours that involves potentially mutual infringement, i.e., that you would each be alleging infringement from the other. That you haven't sold it helps as does the fact that your work didn't hurt the market for the original work, and probably helped it, at least initially. As you know fan artists typically don't get sued because, if anything, they bring welcome publicity to original works. Making things a little trickier is the resulting discussion you've sparked by posting about all this and how the company might claim that has hurt their market, but that would be a far more complex legal question extending far beyond your derivative work and their use of that work. I'd be interested to see whether it would cause them to pursue legal action. I realize this doesn't give you any satisfying answers, because there aren't any for this question, at least not yet in the legal world. The company definitely retains derivative work rights, and your work is pretty clearly a derivative work. Copyright protection MIGHT apply to your derivative work to the extent that it was transformative, but the fact that it's clearly, admittedly Skeletor doesn't help. Your work was likely an infringement. Fair Use and First Amendment defenses are tough to predict, especially with a fact set as complex as yours. If your work enjoys derivative work copyright protection you might be able to sue a third party infringer, but it would be much harder to succeed against the original copyright holder. Whether that automatically gives the company the right to use your work for commercial gain is a slightly different question. I'm as troubled as you by this company's use of your work, but they unfortunately do enjoy pretty strong protection under the law. If either of you did bring it to the courts it would be a highly interesting case in light of the alleged mutual infringement and how those claims impact one another, and it would be very difficult to predict how it would come down. That was all very basic and probably confusing, so, again, please feel free to let me know if you'd like to chat about it any more. So where is the link to that sale of this MOTU Blu Ray? I can't find it anywhere. Something I forget to mention in my last comment...the notion of property. What it 'property' after all? An invisible line that says this is mine and that is yours? Who is "me" and who is "you"? The separation between subject and object is an illusion. There is no two, only one. Stated differently, two is always secretly ONE. Okay, back to the notion of property, it's made-up invisible boundaries that exist only in our minds and through mutual consent but really it isn't there. This is how capital can flow and perpetuate itself, through arbitrary made-up boundaries that exist in our psyches. Once a boundary (an IP for instance) is defined, it can be considered "property" and then invested in with fake value we collectively call "money". When something like MOTU becomes part of public consciousness it's pretty hard to stop someone from making and selling fan art. They'd have to make a pretty big splash to get attention (kind of like Dave did with TMNT). Anyways, I'm just rambling now. The problem here is the illusion of the separation between subject and object. Egotism perpetuates this illusion. 'This is "mine" so pay me for it'. Maybe if we shared more, the profits will come back around in the long run. Not just for "me" and for "you" but for all. All is all there is (I know, I an annoying answer but true nonetheless). Dave you have no leg to stand on. You owe every profit you have made to the rights holder. You know that right? Everyone knows you made your entire name using other people's IP now. Yeah the stuff was well painted but you lifted the stuff, profited on it, and still trade on others property to this day. If not for others property you would not be where you are. You are an art thief and whether your fan boys or you want to admit it or not, you essentially committed and admitted to copyright violations and intellectual property theft. Want to get on with life? stop using the content you lifted for any reason and stop using others IP to make a name for yourself. But we all know you won't take that stuff out of your portfolio. It's bringing in too much money. You should be ashamed of yourself. And Wessels...you need to get off the weed dude. Seriously. That was garbage. There is a difference between fan art and building a body of work being used to develop your personal brand for the sole purpose of profiting off another persons property. There is a big difference between making fan art and then selling it like a plagiarist. Art theft is art theft. Anyone who sees any of this as OK is part of the problem and doesn't beleive in artists rights. If you wait to work for the companies you want to work for without ever showing them what you could do for them, then it will never happen. That's unfortunately just how it works. DC wants to see how you draw superman, Marvel wants to see how you draw Wolverine, and movie people want to see how you'd interpret popular characters in a realistic light. Or that was the trend, thankfully it's shifting a bit. This is not my creation, this is how the industry has always worked, it's just that now we can self promote via the internet and have created a gray area. Right or wrong, it's how people do business. It's funny you wrote this today. Today I happened to discover your work for the first time. I was very impressed. So much so, that I made your Skeletor my Facebook profile picture. Of all your pieces, what a coincidence I chose that one. I suppose I am also guilty of theft. Never mind, you didn't write this today. Not sure where my head is at. But still. I read it today, so that counts for something. Drawing of existing characters, so called fan art, is and has always been a recruiting tool for most publishers. There was a discussion recently, on Twitter, where Jake Wyatt spoke about the importance of fan art in order to get the eyes of the publishers on your work. Exactly as Dave said, in Jake's case having made some fan art of X-Men characters made Marvel recruiters check the rest of his work. But it was the same in pre-Internet era. You often had to show full comic pages, even with existing characters, to publishers; while original work was encouraged, in practice showing that you were drawing a kickass Batman or Wolverine within a well-drawn and edited story helped immensely. About the rest of the issue, I do not know what to say as I know very little about copyright laws. If anything, Dave's depiction of Skeletor made me see the old Masters of the Universe series under a different and more interesting light - and mind you, I am not even usually a fan of hyper-realistic depictions of cartoon characters. Same thing with TMNT: I never cared too much for the TV series, but Dave's paintings made me check the history of the series and I then discovered the comics, which were much more in line with Dave's depiction. Dave used something but also gave back something really valuable, and in some cases gave focus to series that had been watered down over the years. An owner of an IP has rights to all fan created works, and that's really what matters in the end. Fan art IS allowed, but the IP owner can use it as they decide as it is their IP, otherwise you're in for a rough legal battle that you will not win. To what extent an IP will be "protected" is at the discretion of the owner. That's all there is to it. No theft happened in the eyes of the law, and being ignorant to the law doesn't change this. You can certainly avail the benefits of online court approved theft classes if it is your first time to commit such a crime. For the past few years, the experts have found out that the potential crimes are reduced because of the help of court approved theft classes provide to remedy the psychological needs of the offenders. Some individuals take personal property because they enjoy this type of activity or they are just bored and they want to do something that will ease their boredom. The class will teach the thief to find a suitable alternative. Instead of shoplifting, they could turn to sports and other useful and significant physical activity. Supplier and more importantly retail stores are not exactly paying for the costs related to shoplifting as much as the person posting this article would have you believe. Every t-shirt, pair of pants, shoes or anything else you buy already has a price percentage placed into it in order for the retailers to recoup their losses from shoplifting. I don't feel bad for Wal-Mart or any other retailer because I know that I'm paying for their shoplifitng problems every time I purchase something there. Facebook is certainly the most enviable promotion platform for self-promoters, marketers, advertisers and companies. As various people are mesmerized about attention and exposure they like from their online network and distanced friends, companies are busy in getting the self-belief of online users through their Facebook Page. Companies can gain too much popularity and fame if they buy facebook fans. Nowadays, buying Facebook fans is not a major concern. There are millions of online companies that assure to provide you ‘real,' ‘active’ and ‘genuine’ Facebook fans for a small amount. Several brands are buying such fans to expose themselves as recognized companies with the huge fan base..
Like you said, it doesn't matter what your actions were in the past, even if they are in the same vein as the thing you're fighting against now. The "You're not one to talk" argument doesn't fly. There isn't a "Karma" sub-section of US law. If you've been to jail for theft, the cops still investigate if your house was robbed. Like you mentioned, it's not relevant what your movements had been up to now, although they are within the identical vein as the item you're combating against now. The "you're no longer one to talk" argument would not fly. There isn't a "Karma" sub-component of US law. In the event you've been to penitentiary for theft, the cops still examine in case your house was robbed. This is very useful information for me. Thank you very much! I think you need thisreflective essay thesis.